The Somali militant group al-Shabab has claimed responsibility for a deadly attack on a hotel in Mogadishu Sunday, leaving at least 12 people dead, including the owner of the hotel, a military commander and two lawmakers. 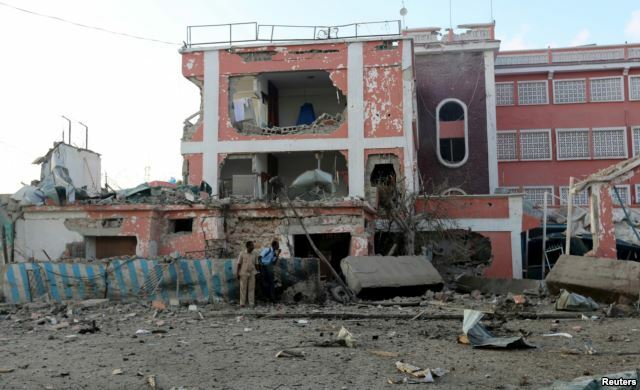 Authorities say the militants set off a car bomb at the entrance of the Sahafi Hotel in Somalia's capital. 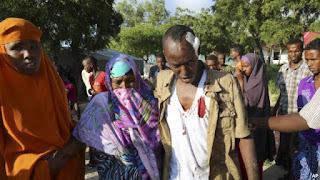 Following the blast, gunmen stormed the hotel, which is popular with government officials and business executives. Somali Security Minister Abdirizak Omar Mohamed told VOA the attackers, all of whom were killed by security forces, were wearing Burundian military uniforms which he says they may have obtained during al-Shabab’s deadly attack on a Burundian military base in Leego in June this year. He said some of the attackers are “foreign-looking” but says they are still investigating to determine exact identification. Security officials said the attack, which started at daybreak, was over by midday. The groups controlled most of southern Somalia as recently as 2010, but was pushed into the countryside by African Union and Somali government forces. The militants carry out frequent attacks, often targeting government officials and African Union troops. The group seeks to impose a strict form of Islamic law on the country and has frequently beheaded, stoned to death or amputated the limbs of people accused of various crimes. U.S. Secretary of State John Kerry, left, and Uzbek President Islam Karimov shake hands before a meeting at the Palace of Forums on the President's Residential Compound in Samarkand, Nov. 1, 2015. U.S. Secretary of State John Kerry met Sunday with Uzbekistan's President Islam Karimov, a rare high-level U.S. encounter with the autocratic ruler and frequent target of human rights criticism. The two held talks in the ancient Silk Road city of Samarkand on the fringes of a diplomatic gathering of his five central Asian counterparts aimed at reassuring them of Washington's continued engagement in a region seen as exposed to militant Islam. 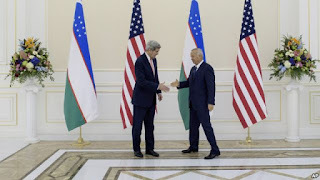 "Kerry and Karimov discussed global issues of shared concern including combating violent extremism as well as regional security and stability," said State Department Deputy Spokesperson Mark Toner. The 77-year-old Uzbek president has led the country since 1990. Kerry thanked Karimov for hosting the first gathering of the C5+1, a new format for dialogue among the United States and the five Central Asian republics - Kazakhstan, Kyrgyzstan, Tajikistan, Turkmenistan and Uzbekistan. The group was formed to deepen cooperation across a range of issues, including human trafficking, counternarcotics, and supporting the security and the stability of Afghanistan. But it was energy security that topped the agenda. "Just that topic alone - energy security and diversification - would merit our meeting and getting together in the circumstances we are," said Kerry. "And we’ve made a good start on projects like CASA-1000, which is going to create a regional electricity market from Central to South Asia." U.S. officials regard Kerry's visit as a way of assuring the Central Asian nations of the strength of their ties to Washington at a time when U.S.-Russian relations are on the decline. But he is also under pressure to speak out against the shortcomings of their human rights records. U.S.-based Human Rights Watch asked Kerry to press for the release of people wrongfully imprisoned, end impunity for torture, and uphold other key rights commitments. "The countries of Central Asia pledged to meet international standards after they became independent, and each is working with us and themselves in order to meet those standards. [Here], as elsewhere, people have a deep hunger for governments that are accountable and effective," said Kerry. The Committee to Protect Journalists recently urged Kerry to bring attention to journalists jailed for political reasons and online censorship, and to decry physical attacks on members of the media. CPJ said its research indicated media freedom has "steadily worsened" in Central Asia in the post-Soviet era. South Korean President Park Geun-hye, center, Japanese Prime Minister Shinzo Abe, left, and Chinese Premier Li Keqiang attend at a business summit in Seoul, Nov. 1, 2015. The leaders met for their first summit talks in more than three years as the Northeast Asian powers struggle to find common ground amid bickering over history and territory disputes. In Seoul Sunday leaders from China, Japan and South Korea met for the first time in three-and-a-half years to restart stalled regional cooperation and end their diplomatic standoff over the contentious issues that divide them. "Through trilateral cooperation I believe that we will contribute to the peace and prosperity and security of not only our three countries but the region and the international community." said South Korean President Park Geun-hye at a news conference following the summit. President Park hosted Chinese Premier Li Keqiang and Japanese Prime Minister Shinzo Abe for talks that all three leaders described as in-depth and frank. Beijing and Seoul had suspended these regular high-level meetings with Tokyo in 2012 over territorial disputes and concerns that Prime Minister Abe has been trying to downplay past atrocities committed by Japan’s military during its colonization of much of Asia until the end of World War II. At the news conference Chinese Premier Li said their historical disagreements must still be resolved, but they should not block regional economic and security cooperation. “We need to achieve mutual understanding regarding history and historical issues and we need to look toward the future and agree on a future direction based on dialogue and cooperation,” said Premier Li. 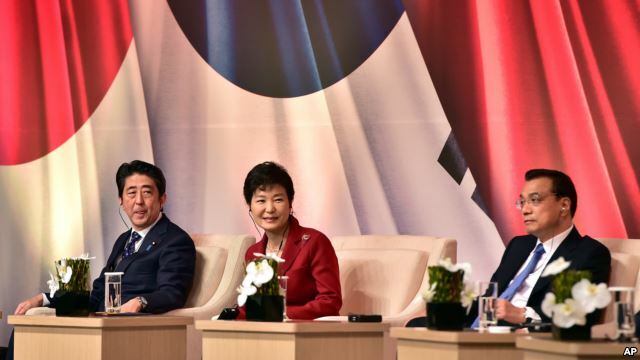 Neither Park nor Abe addressed their historical disagreements at the trilateral news conference. The South Korean president and the Japanese prime minister will hold their first bilateral meeting Monday and will likely focus more on this contentious issue. 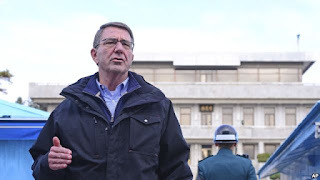 Until recently Park had refused to meet with Abe until he apologized for the thousands of Asian “comfort women” forced into sexual slavery by Japan’s military during its occupation of Asia and World War II. Abe has articulated condolences for the victims and promised to uphold apologies made by past Japanese leaders, but he has refused to accede to Seoul’s demand for stronger language and compensation. 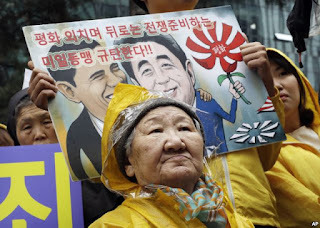 Former comfort woman Kil Un-ock who was forced to serve for the Japanese troops as a sexual slave during World War II, attends a rally against a visit by Japanese Prime Minster Shinzo Abe to the United States, in front of the Japanese Embassy in Seoul, South Korea, April 29, 2015. Negotiations for the 16-country RCEP began in 2013 but have stalled of late. This all-Asian free trade agreement includes the Northeast Asian powers as well as India and Australia, but not the United States. Many see the RCEP as a China-driven rival to the U.S.-led Trans Pacific Partnership that was recently agreed to by 12 Pacific Rim economies that includes Japan and the U.S. but not China. Prime Minister Abe said all three leaders saw “eye to eye” on the need for regional free trade agreements and he not did see any conflict with Japan being part of both the RCEP and TPP. South Korea has expressed an interest in joining the TPP in the future. China has not voiced an interest in joining the trade pact but said it hopes the TPP will boost economic growth in Asia. 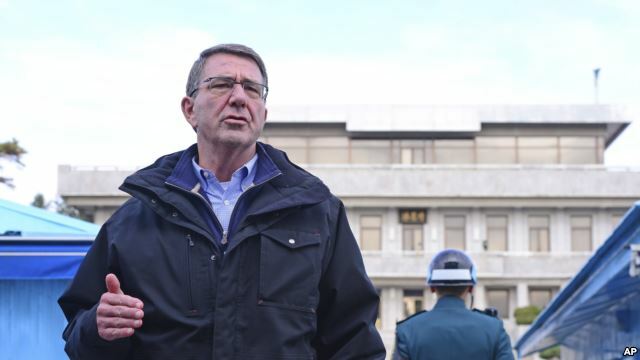 In 2007 the “six party” talks that involved the U.S., China, Russia, Japan and the two Koreas reached an agreement for North Korea to shut down its Yongbyon nuclear reactor in return for emergency energy assistance. In 2009 Pyongyang walked out of the talks, expelled international inspectors and subsequently conducted three nuclear tests that have drawn international condemnation and increasing U.N. sanctions. Seoul and Tokyo support Washington’s position that North Korea live up to its past agreements and halt its nuclear program before any new talks can begin. Beijing has voiced support for greater communication and cooperation on this issue and is expanding economic ties with North Korea.